This week I jumped full-force into carving the rosettes for the tall clock. I don’t often carve; it’s not one of my favorite things in woodworking, which is probably why I moved so quickly into Federal-period furniture. As I worked the first ten minutes in earnest to produce the final design of the rosettes – I need two rosettes for each clock, or four total pieces – I knew it would be a short work day if I didn’t find a way to ease my back pain. My bench is set up more for power-tool woodworking, so it is a bit higher by design. But that height wasn’t cutting it for carving. My quick solution was a carving lift that would raise the work surface nearly 12″. As stated, I’m not an every-day carver, so I didn’t need anything that would be worthy of a magazine article build. I needed quick and simple. Thank you Kreg jig. I ripped a few pieces from my collection of scraps, chopped the appropriate lengths at my miter saw then screwed together my carving lift. The additional length at the bottom, plus the wide-open area between the ends, makes clamping the unit to my workbench a snap. The top, over-hung in both length and width, allows me to easily clamp and re-position the work as needed. Will this lift be around forever? Nope. That’s the way it was designed. When I’m finished I’ll pull the screws and stack the pieces back in my scrap pile. Did the extra height work out? You bet. The only pain I felt the the balance of the day was from a few carving mishaps and a couple of wood blowouts. My back was fine. 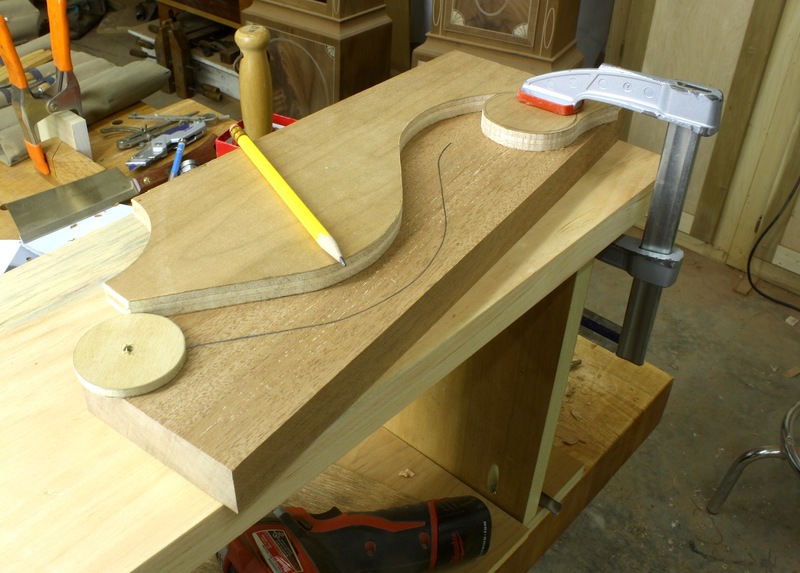 A second tip I found useful as I carved on the clock’s goose-neck mouldings was a technique I discovered as I built my first goose-necks for a highboy years ago. I think it’s worth repeating. In the above photo, you see that I have made a pattern of the half of the top edge of the scroll board. The mouldings for the clock are 7/8″ tall, so I need to produce a line that is exactly that distance down from the pattern. I could use a compass to scribe the line, but that would require that I be consistent as I trace the pattern. That’s room for error. To make it almost foolproof (nothing is completely foolproof), I cut and shaped a piece of plywood to 1-3/4″ in diameter, or a 7/8″ radius. When I slip a pencil through the small hole at the middle of the wheel and roll the wheel along the pattern, I’m assured of an accurately marked distance. I use this technique whenever I need to produce an accurate offset line. Most times I find a washer (fender washer) that works for the necessary size. But as you grow in the distance you need to offset, you move beyond typical washers found in a home center or hardware store. It’s then that I turn to shop-made wheels. This is one to keep in your pocket. It works. Next week I’ll post about the goose-neck mouldings. 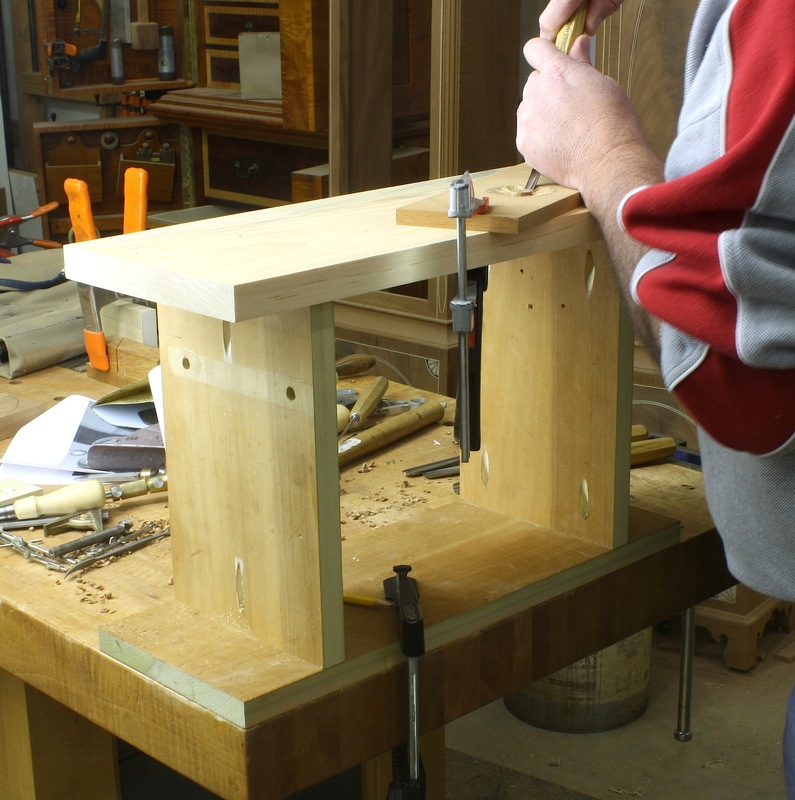 The profile comes off the router table using easy-to-find router bits.